In this interview, AZoM speaks to Venkat Nandivada, Manager of Technical Support at Master Bond Inc., about Underwriters Laboratories (UL) 1203 Standard, how critical it is, and the epoxy systems that meet this standard. What is Underwriters Laboratories (UL) 1203 standard and how critical is it? (UL) 1203 is defined as the “Standard for Explosion-Proof and Dust-Ignition-Proof Electrical Equipment for Use in Hazardous (Classified) Locations.” The rationale for this test is to prevent explosions and dust ignitions in industrial settings as flammable gases, vapors, mists, and dusts are inevitably created in many processes. The 1203 UL is designated for a sealing / potting compound for use in hazardous locations conforming with Class I, Groups A, B, C and D; Class II, Groups E, F, and G Hazardous Locations. What testing is carried out for certifying an epoxy for this UL1203 standard? This standard contains technical requirements needed for electrical equipment to be labeled as “explosion proof” and “dust-ignition proof”. To test an epoxy, sample castings in groups of 6 are exposed to saturated vapors in air for the following chemicals: Acetic Acid (Glacial), Acetone, Ammonium Hydroxide (20% by weight), ASTM reference fuel C, Diethyl Ether, Ethyl Acetate, Ethylene Dichloride, Furfural, n-Hexane, Methyl Ethyl Ketone, Methanol, 2-Nitropropane, and Toluene. After 7 days of exposure to these vapors, the samples are observed for discoloration, swelling, shrinking, crazing, cracking, leaching, and dissolving. The samples are also subjected to a crush test. For the crush test, the crushing force should be at least 85% of the original value. What are the National Electrical Code (NEC) classifications mentioned above? How are the materials broken down for further classification? Does Master Bond have any epoxy systems that have been tested according to UL1203? Master Bond EP41S-6 is a two part epoxy system that has successfully met the requirements of UL1203. Small castings of approximately 1 gram were prepared for testing. UL assessed the performance of each set of castings in the manner described above: for 168 hours of exposure to the chemicals noted. EP41S-6 resisted each and every chemical without exception. More importantly, the crushing force for EP41S-6 was not less than 85% of the original value. Consequently, EP41S-6 is suitable for use in Class I, Division 1, Groups A, B, C, and D, and Class II, Division 1, Groups E, F, and G, in accordance with the National Electrical Code, NFPA 70 (National Fire Protection Association). What are some of the other salient properties of EP41S-6? EP41S-6 is a thermally stable compound that has a glass transition temperature of 145-150°C and is serviceable from -80°F to +500°F [-62°C to +260°C]. It offers a high dielectric strength of 440 volts/mil at 75°F for a 0.125 inch thickness. The optimal cure schedule for EP41S-6 is overnight at room temperature, followed by 6-8 hours of heat curing at 150-250°F. With a mixed viscosity of 30,000-40,000 cps at 75°F, this compound features good flow properties. 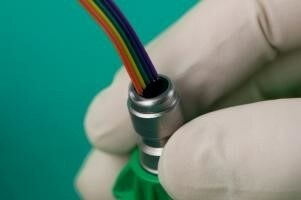 This makes it ideal for sealing and potting applications for electrical feedthroughs across various industries. Venkat Nandivada has been the Manager of Technical Support at Master Bond Inc. since 2010. He has a Masters in Chemical Engineering from Carnegie Mellon University. He analyzes application oriented issues and provides product solutions for companies in the aerospace, electronics, medical, optical, OEM and oil/chemical industries. See all content from Master Bond Inc.